A CD or DVD can be a fantastic addition to any vinyl project, and they clearly still have the ability to be sold as a standalone product as well. For our customers, their use is quite varied, probably close to 50/50. 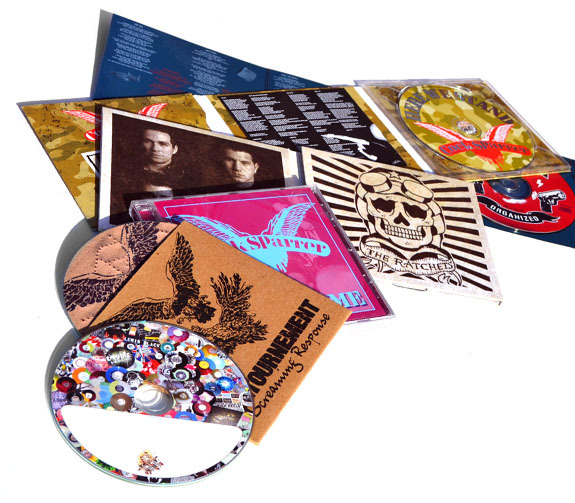 The options we have to package CDs and DVDs are as diverse as any company out there. Almost all of our CD and DVD packaging is also made in Europe alongside our vinyl packaging, thus making it very easy to coordinate it with a vinyl project, or even just a European tour. We have literally hundreds of different (standard) products to choose from, and we're constantly creating new ones! Our most common products are a variety of cardboard sleeves, digipaks, digifiles (digipaks without the plastic tray), and even super deluxe casewrapped boxsets… and yes, of course the traditional DVD Amaray case, and jewel case for CD's, – and even it's newer slicker cousin the "super" jewel case. If you don't see a template for the product you're looking for to house your next CD or DVD on our site, just ask, because we've probably made it before – and if not, we certainly can! With one of the largest and best full service printing facilities in the world essentially under the same roof as our CD and DVD lines, we have a world of packaging at your fingertips – and even making a custom product does NOT have to take an eternity and involve a series of hoops for you to jump through. We can make it all very easy for you, so you can spend your time selling your product, not making it – leave that to us, that's our job!